Sony and LG have been pushing OLED TVs in India for a while now, and though they’re still largely out of the average consumer’s price range, their appeal is undeniable. What OLEDs lack in brightness, they make up for with deep blacks that create an immersive cinematic feel. That’s something we’ve been missing since the good old plasma panel days, and we can now have that, plus all the benefits of HDR, higher resolutions, and incredibly slim bodies. This brings us to the Sony A8F. It’s not the top-end model in Sony’s 2018 range of TVs — that would be the A9F — but it is premium nonetheless. It doesn’t have a quirky photo-frame-style slanting stand like last year’s Sony A1, which we think is a good thing, because we prefer this more sober look. With the competition in the TV market getting fierce, and the rise of budget players, does Sony still have a clear advantage? Let’s find out. The Sony KD-55A8F — the 55-inch A8F model — has a clean, understated look overall, with a thin, black border that runs along the edges of the screen. It’s pretty close to a bezel-less frame, and would look very good if mounted on a wall. When it’s not mounted, this TV has a unique stand that barely raises the unit at all. This could require you to re-plan your furniture or the placement of your set-top box. The stand looks like a thin, flat surface from the front, but there’s a bulkier protrusion at the back for support. It looks minimalist but the TV is well supported and did not seem susceptible to tipping over even when we tried. Thanks to the OLED panel, the body of this TV is extremely slim at the top, but gains thickness (5.69cm) at the back, to accommodate all the electronic components. Sony has consciously kept aesthetics in mind and has provided enclosures for all the ports, along with cable organisers to keep even the rear looking clean and uncluttered. There’s just a small grille at the centre of the back for the woofer. Overall, this TV is simple, yet very aesthetically pleasing. The remote is identical to what was offered with the previous generation of OLED panels, which means that there’s still no motion control. It’s a pretty major miss, considering that most manufacturers are offering that either in their main remotes or as separately bundled controllers for their smart TVs. That said, navigating the card-based Android interface is simple enough using the traditional cursor buttons. The remote has a smooth rubberised texture and the buttons give good feedback. Voice control worked very well for the main interface, and we were able to get the Google Assistant to fetch videos from Google Play Movies and YouTube. The OLED panel has a 4K Ultra-HD resolution of 3840×2160 pixels. HDR support includes the HDR10, HLG, and Dolby Vision standards, unlike last year when Dolby vision was added as an update. Apps such as Netflix and Amazon Prime Video will offer Dolby Vision right out of the box, instead of just ‘HDR’. The panel uses Sony’s Triluminous colour rendering engine to improve overall colour saturation. Sony’s X Reality Pro engine upscales non-4K media. Upscaling has been a pretty strong feature for Sony’s flagship panels, and we’ll talk more about this when we get to this TV’s overall performance later in this review. 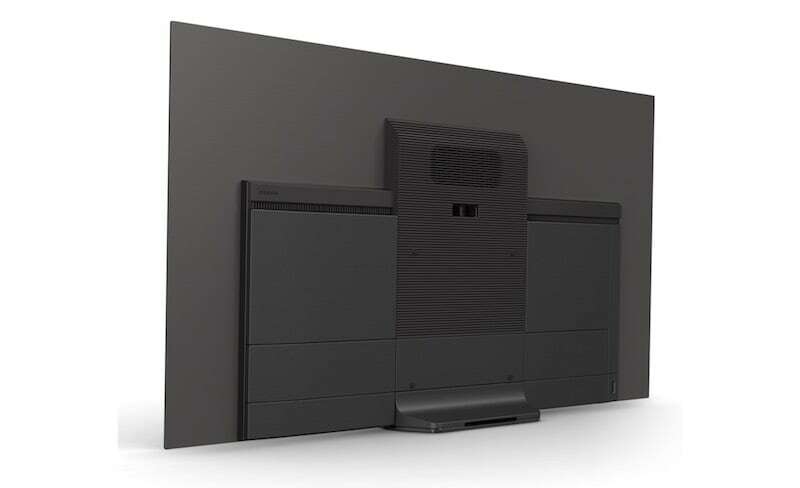 A very interesting feature that Sony uses on its OLED TVs is its Acoustic Surface speaker technology. This produces audio by vibrating the screen itself at high frequencies that aren’t noticeable to the human eye. That combined with the sub-woofer at the back gives you a complete sound system without the need for speaker grilles or additional bulk. There are two rows of connectors in the rear. On the bottom, we have the Ethernet port, an RF antenna input, three HDMI inputs one of which supports ARC (Audio Return Channel), an optical output for audio, and a USB 3.0 port. On the right side, you have a row with composite connectors, an additional HDMI port, two USB 2.0 ports, a connector for an IR Blaster, and a 3.5mm audio output. The TV also supports Wi-Fi 802.11ac and Bluetooth 4.1. Finally, there’s built-in Chromecast functionality to let you stream media from any compatible source, such as your smartphone. OLED screens have a clear advantage over LCDs when it comes to black levels. This is most evident when playing video or even a game that’s set in the dark. True blacks also allow for richer overall colour depth, and so colours are vivid without getting overly gaudy. We played the new Spider-man game on a PS4 Pro, which was a great example of this as it has scenes with some great colours and contrasts as well as some of the best HDR effects we’ve seen in games so far. 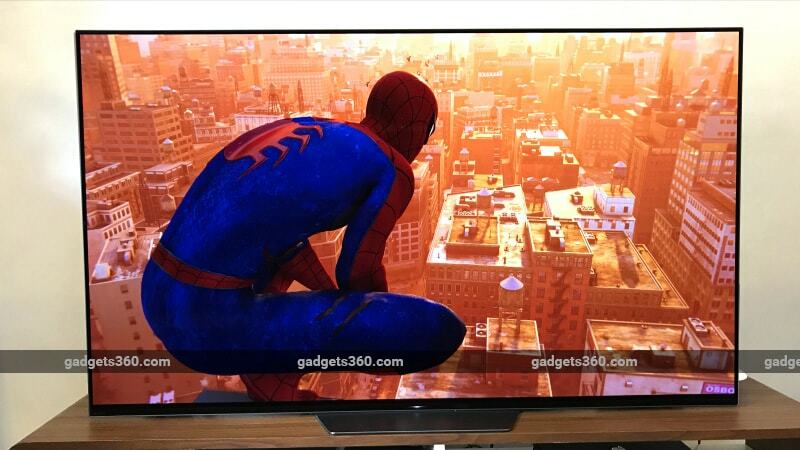 On the Sony KD-55A8F, it was all beautifully rendered, with the bright reds and blues of Spider-man’s costume juxtaposed beautifully against the naturally warm tones of New York’s skyline. In movies and TV shows that support Dolby Vision, the HDR colour tones made scenes appear natural, without letting bright colours dominate our attention. The shows we tried included Marvel’s Punisher and Stranger Things. We also watched Jack Ryan on Amazon Prime, which supports Dolby Vision on the TV’s native app. The panel showed off how bright it can get in sunny scenes, and that was great to see from an OLED panel. The native YouTube app supports 4K HDR as well. Bright as that may be, we still find that QLED TVs can do much better, compared to KD-55A8F’s peak brightness of less than 1000nits. 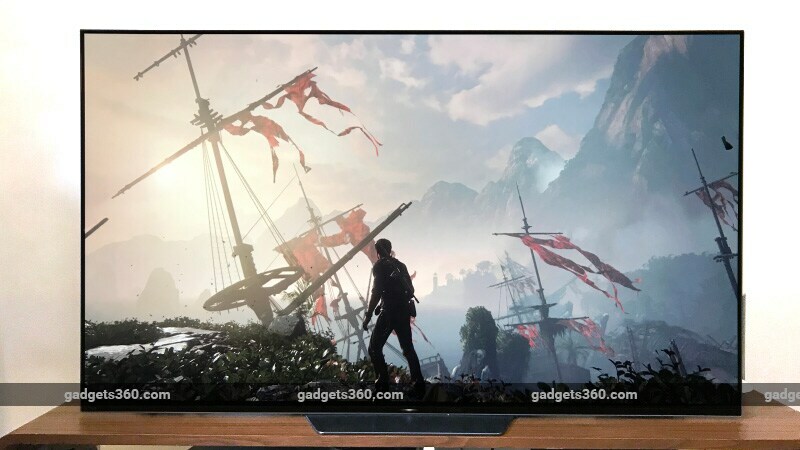 That could be a negative for HDR enthusiasts considering that you still need to spend flagship-level money for this TV. Deep blacks of course work really well, but we missed the light pops that we’ve seen from brighter panels. If it’s higher peak brightness you’re looking at, you should consider a QLED TV instead. Sony does a great job of upscaling and blur reduction on its premium TVs, which is very evident here. 720p content from YouTube and 1080p movies from Google Play Movies didn’t seem like eyesores. In fact, the output was perfectly acceptable to watch, especially if you’re sitting more than 6 feet or so from the screen. We wouldn’t suggest playing standard definition content though, as the output did get noticeably blurry when we tried it. 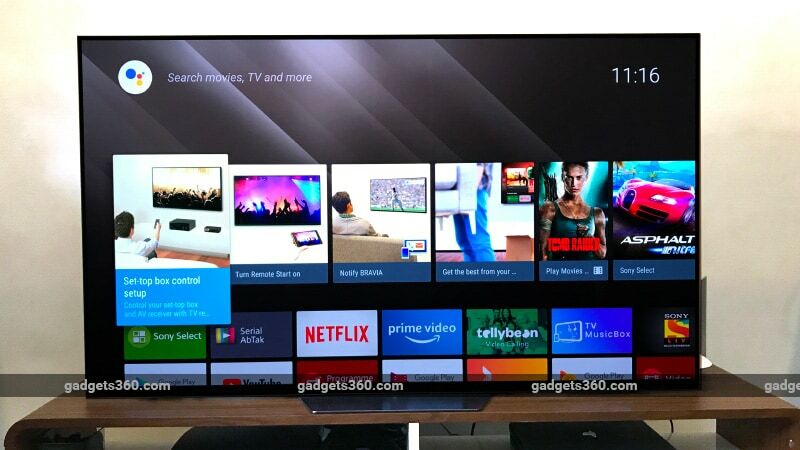 Android TV is generally user-friendly and offers a card-based interface that lists the TV’s apps in categories. Netflix and Amazon Prime Video come pre-installed, along with Sony Liv and other popular apps. The ones that aren’t preinstalled, such as Hotstar and Zee 5, can be found in the Google Play Store. The Sony KD-55A8F also integrates Google’s services including Google Play Movies, Google Play Music, and Google Assistant for voice search. The biggest problem with Android TV on this and on every TV we’ve tested it on is its speed. The interface is a bit laggy and not as responsive as we’d want from a premium TV. This is something we’ve come to expect from Android TV at this point. The remote’s cursor buttons, as we said, work fine, but there are times when we’d like to quickly move to the opposite end of the screen to click on an app. Typing is also easier with a motion-control remote. As we first experience with last year’s Sony A1, the Acoustic Surface makes for a wonderful TV speaker. The KD-55A8F manages to produce room-filling sound, complete with a stereo effect from the screen itself. When dialogue is spoken, it sounds as though it is coming directly from the character on the screen, while music and effects surround you pretty well. Audio was crisp, and the bass, though not too deep, was quite effective. It wouldn’t be too much of a loss if you don’t have external speakers for the KD-55A8F, though there is room for improvement for sure.